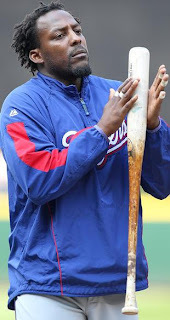 Off Base Percentage: Why Is Vlad Guerrero Still Homeless? Vladimir Guerrero is coming off of a rebound season in 2010 hitting 29 home runs and a .300/.345/.496 slash line. But he was signed to just a one-year deal with Texas and now he's stuck in free agency limbo while the market dries up around him. Guerrero doesn't have many potential landing spots remaining since he didn't opt for the Six Million Dollar Man surgery and runs like an arthritic deer on ice. I love Vladdy but watching him play the outfield in the World Series was embarrassing for everyone involved. The Vladimir Guerrero talks will gather some momentum in the next 48 hours, one way or another. The Orioles have an offer on the table; last week, Guerrero's side informed them that they had an offer worth $8 million in play. It's not clear which team would have made the $8 million offer. In this case, I'm inclined to believe the mystery team is actually a figment of the Guerrero camp's imagination. MLB Trade Rumors identified four potential fits for the 35-year-old DH in the Orioles, Blue Jays, Rangers and Angels. It's hard to imagine any of those teams offering $8 million for what would basically have to be a part time designated hitter. If you take a closer look at his bounce back 2010 numbers, there's cause for more trepidation in offering Vlad a lucrative deal. All you have to do is look at his splits. So maybe the Angels would offer him $8 million and perhaps a couple of extra years to boot. Vlad has always crushed the ball in Arlington and that certainly gave his 2010 season a boost. He gave up 31 points of batting average, 18 points of on base percentage and 66 points of slugging percentage. It's not the worst split I've ever seen but it's not an encouraging sign for an aging hitter. Vlad also tired down the stretch and hit .220/.242/.271 in the playoffs. Splitting time might keep him fresher but surely $8 million is too much to pay for a part time hitter. Let's take a quick look at the projections for Vlad which assume he's going to be an everyday DH. James seems high but let's split the difference and call Vlad a .360 wOBA hitter as a full time DH. That would be exactly what his wOBA was in 2010 when he was a 2.6 WAR player. That would make him worth about $10 million for 2011. But as I said, if he signs anywhere but Baltimore, he is likely to be a part time hitter. The $8 million offer would make sense for one team but, unfortunately for me, that team hasn't been thinking clearly this off-season. Dave Cameron suggested that the Angels sign Vlad but his reasoning makes too much sense for the Halo's front office. The Angels could get some nice production from Guerrero at DH but, more importantly, his playing time could prevent Bobby Abreu's 2012 option from vesting. It's almost too good to be true like a magical clause that could void Vernon Wells' contract. My guess is that this plays out for another few days and the Orioles kick it up to around $6 million and sign him. Solid pick-up for the price, as a DH of course. 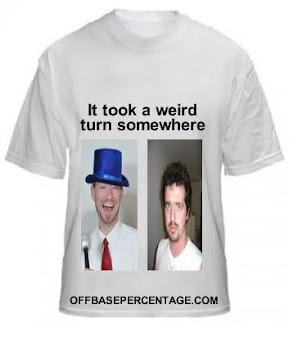 At first you are surprised, but when you get familiar with the GMs who are bozos in MLB it's not so much.....unless they are waiting for the price to hit the basement. MTD's wiffle ball team still needs a DH/outfield fall down guy. Well, I got the right team and I had them moving up from their initial offer. I just didn't have the Orioles as the mystery team too. In other news, Tony Reagins saw his shadow and now we get two more years of Bobby Abreu.